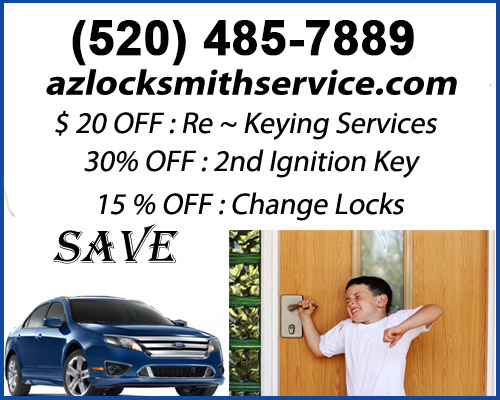 For all of your Residential Locksmith needs here in Tucson Arizona. We only offer highly-educated and expert locksmiths who specialize in residential work who will solve your locksmith needs anytime you need locksmith service. For all of your residential locksmith needs contact us for a quality-assured job! No matter the time, day or night our 24/7 residential services is always here to help you. All of our locksmith technicians are equipped to complete their work fast, on site and right, the first time! Broken key in the front door lock? Our residential locksmith service is prepared to assist you We are your best choice for residential locksmith service in all Tucson Arizona. Our services are, but not limited to: repairing of locks and upgrading/installation, safe and vault service/sales/installation, master rekeying, rekeying, key duplication, missing key and keys re-cut, lock maintenance, security hardware installed/sold and more! There is no doubt you will you be contented with all the work performed by our experienced residential locksmith pros in Tucson AZ . We care about our customers and we are pleased to offer our superior locksmith services at very reasonable prices. The time our services are rendered have no bearing on what we charge, our services always cost the same, regardless of when you need our assistance days, nights, weekdays, weekends or holidays. which is an international group of security professionals dedicated to ensuring standards of high quality locksmith services for customers.